Residents and businesses of Corona have benefitted from Superior Cleaning and Restoration Inc.’s tile and grout cleaning services for years. Our team of skilled professionals are skilled at taking care of your cleaning needs and in the sealing of all types of stones and tiles the market has to offer. Be it marble or travertine, granite or terrazzo, we are highly skilled in the processes involving the stripping, cleaning as well as the sealing of stones and tiles. In the case of grout cleaning we are well equipped, we can scoop out the dirt that has been collecting between your tiles and leave the lines looking as fresh as the day they were first laid. Cleaning stones, tiles and grout can be a tiresome and difficult job when cleaning solutions, dirt and grime build up making the appearance of your grout look really bad. The normal do it yourself techniques have proven incapable of providing effective means of getting the grout and pores of the tile clean. Our services handle the tough job with ease at a low price. Superior Cleaning and Restoration Inc. employs the use of powerful truck mounted cleaning systems that are effective for the cleaning of showers, floors and countertops. Adding to the system is the powerful cleaning solution that is unique to us and has been designed to tackle tough problems with ease. Our equipment thrives where most equipment used by other companies fail. Once we clean, we will use a penetrative sealer to protect your tiles and stones from future staining. 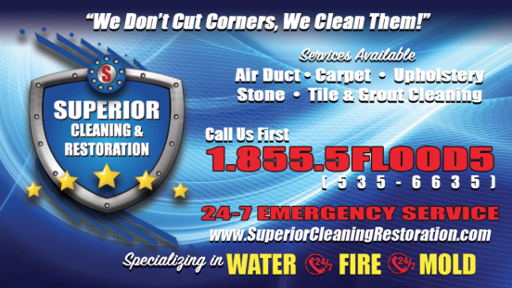 Feel free to call on Superior Cleaning and Restoration Inc. for all your cleaning needs.